Q1 inflation data is due from NZ on Wednesday 17 April 2019, local. We expect overall consumer prices to rise 0.2% in the March quarter, lowering annual CPI inflation to 1.6%. Our forecasts are in a similar ballpark to those of the RBNZ and, although we are on the cusp of a quarterly 0.3% outturn (+1.7% yoy), risks appear broadly balanced. Abstracting from seasonal and transitory influences on the inflation process, we expect annual readings from the core inflation measures produced by Statistics NZ to oscillate around 2%, with annual inflation from the RBNZ sectoral factor model stuck below 2%. 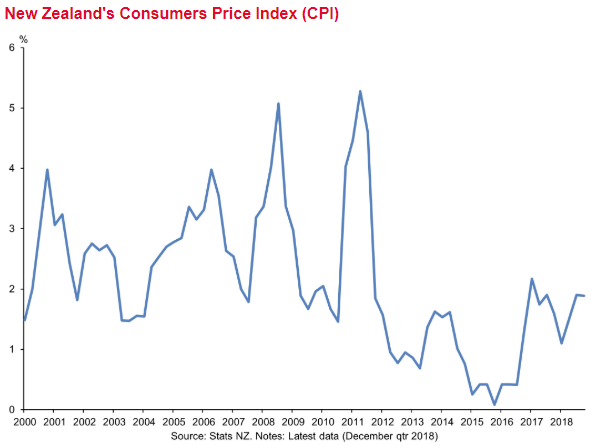 Our view is that downside risks to the inflation outlook have grown in recent months and the NZ economy looks increasingly unlikely to be able to generate sufficient economic momentum that will be able to keep inflation comfortably within the 1-3% CPI inflation band. However, we freely acknowledge the risk that this may take time to become readily apparent in the NZ inflation figures. Note that ASB mention the RBNZ sectoral factor model (measure of core inflation from the Bank). That data point will be published later the same day.